When I saw these... things... the first thought that popped into mind was "If Jerry Falwell were still alive, he'd declare them both to be gay." 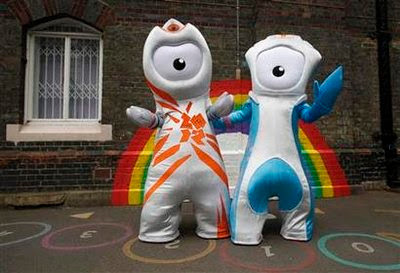 Kang and Kodos... errr, I mean Wenlock and Mandeville, are the official mascots of the 2012 Summer Olympics in London. If nothing else, Wenlock and Mandeville will have us all forgetting that Izzy from the 1996 Summer Olympics in Atlanta ever existed.